Royal weddings, with their pomp and splendor, only come along every so often, and media companies are making sure they rake in every last dollar available. When Prince Harry and American actress Meghan Markle tie the knot on May 19, they’ll be live on news networks across the globe and plastered across the covers of special magazine issues. Royal weddings, with their pomp and splendor, only come along every so often — and media companies are making sure they rake in every last dollar available. The wedding is a welcome respite for print and digital media companies that have encountered a tough ad market in recent years. For network TV and cable news networks that have been buoyed by political drama in Washington lately, the royal wedding opens up new categories of advertisers that otherwise tend to avoid the news. The stars have aligned for media companies in a few ways. Interest in the British royal family is at a high point, thanks to no shortage of recent storylines, including Kate and William’s new baby boy, Queen Elizabeth II’s 92nd birthday and even the death of the Queen’s last corgi. The inclusion of an American may boost ratings and readership to new heights. If that wasn’t enough, the wedding is on a Saturday in May, a time that doesn’t normally draw major audiences, offering TV companies a chance to maximize their income. “Not only is it a rare event, it’s also being aired on a Saturday morning, giving more Americans the opportunity to tune in,” said Ashwin Navin, chief executive of the data firm Samba TV. While Prince Harry isn’t directly in line for the throne, his marriage to Markle, who appeared on USA Network’s legal drama “Suits,” is sure to excite more Americans than previous royal events. Markle is biracial, divorced and had a successful TV career before she met Prince Harry, making her a relatable future royal. Town & Country’s editor-in-chief, Stellene Volandes, notes the magazine is planning special events with jewelry companies, which are keen to exploit interest. She said the magazine was already seeing record numbers on its website since news of the wedding was announced. “It’s a great opportunity across all categories,” she said. For digital news destinations, the wedding is a chance to push some of the oldest and newest ways to monetize social media. 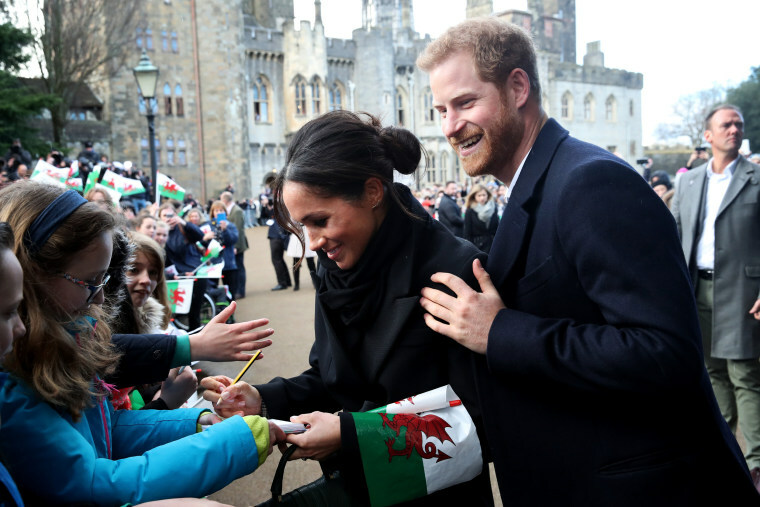 Huffington Post rolled out a royal newsletter, while InStyle said it is publishing shoppable stories online, which let readers click through to websites selling clothes in Markle’s style. InStyle gets a cut of the money from every purchase. The event is also expected to attract a large online audience. The global video-traffic company Akamai reports that Prince William’s wedding in 2011 was the biggest event to stream online that year, scoring 2.9 million concurrent streams. Madison Avenue agency executives are starting to see ad proposals from the digital arms of news organizations that will stream the event in the half-a- million-dollar range, said a senior executive at a major advertising agency who spoke on the condition of anonymity because the source was not authorized to speak publicly on the matter. The main event, however, is still TV, where ratings are expected to be big. Prince William’s wedding to Kate Middleton in 2011 drew 23 million viewers across 11 American TV networks, a much bigger attraction than his parent’s wedding, according to the TV ratings company Nielsen. The wedding of Prince Charles and Lady Diana drew 17 million viewers in 1981. But some networks aren’t just waiting for the big day. Fox and NBC are airing specials in the run-up to the wedding. CBS has already aired “Meghan Markle: American Princess, drawing 5.2 million viewers. The big audience means big ad dollars. Greg D’Alba, a former CNN News president, said the network commanded a premium of 20 percent to 25 percent on the cost of its advertising inventory and created packages around the wedding that cost $2 million to $3 million. Advertisers also had to spend on airtime during the three or four days around the event. “It generated between $7 to $8 million,” said D’Alba, who is now chief executive of VIDL News, a media technology startup. Jon Klein, former president of CNN US who is now running the digital firm Tapp, said political news will remain crucial to driving TV ad dollars, but noted that the wedding offers a bit of a bonus.